There is a bowl sitting on the desk. It is probably about a foot away from my writing hand, and quite profoundly, about 1,000 years old. There is no embellishment on its cream colored body, no adornment of any type. There is an unglazed lip-rim, some pretty crackle-crazing in the glazing. My personal admiration of its simplicity culminates in the recognition that there is no stamp, seal, signature or marker's mark of any kind. This bowl does not bear the burden of ego-ownership. Now let me say quite honestly that that fact does not put this piece above or below any other tea bowl - it just is what it is. The myriad shapes, sizes, colors, and textures of teabowls tantalize the senses as they display themselves on the shelves. So many choices does this life have that people come into the shop overwhelmed and asking what is the best way to brew and imbibe tea. My answer almost always begins with an honest, and by now probably cliche, "take a look around and see what calls out to you." Depending on the disposition of the inquirer, this answer may or may not work. Now being that we specialize in Asian traditional tea, that winds up being the bulk of our tea ware offerings as well - Asian style. However, we do stock tea ware and antiques from other cultures. Sometimes a vintage Brown Betty teapot full of rich pu-erh tea can be quite a nice experience (just ask my mom!). My point is basically: think outside the box. 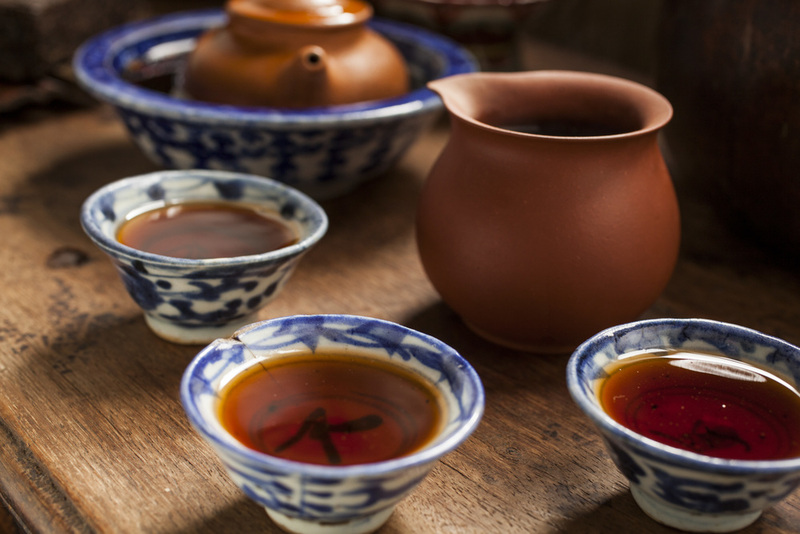 Truly, cultural wisdom has paired tea and teaware through countless generation's efforts and ingenuity. At the same time being honest and adopting what you love instead of what you're being told you need will probably have a more long-lasting and integrated effect in your tea practice. Now, about incorporating antiques. Some people like old stuff, some don't. It's that simple. For myself, being born into an antique-appreciating family, there's never been a question. Antiques are in my blood and the feeling of those things (especially in this fast-paced chapter of humanity) that arouse a sense of material simplicity from days gone by tend to be my daily go-to. Since I mentioned it earlier, there have now been several steepings of Trinity Pu-erh decanted into this Song Dynasty bowl. It sits delicately on a Meiji Era Japanese cup rest and just glancing at it I feel a very human connection through time and space to the places and anonymous craftspeople that produced them. There are no faces or fanciful imaginary landscapes in my mind, just a warmth of shared experience transcending bodies, cultures, and eras. This bowl inspires reverence in me not because it is old, not because it is rare, not because it will "wow" and impress a guest - but just because it's here. It's truly amazing that such a delicate relic could travel 1,000 years intact, yes. But it is the uncanny and inexplicable resonance that I feel with it that humbles me. The Trinity Pu-erh that fills the bowl is a time-traveler, so is my mortal body, actually, everything surrounding me right now is time-traveling! When we look at is this way and assess the productions of items currently available on the market we see that everything "has age on it," even if that "age" is only a couple of weeks. There is no better or worse about it. However, you notice most people devoted to tea having a selection of old things to embellish their presentations. This is not a new phenomenon as you can see in the writings of tea practitioners 500 years ago praising their 300 year old bowl. 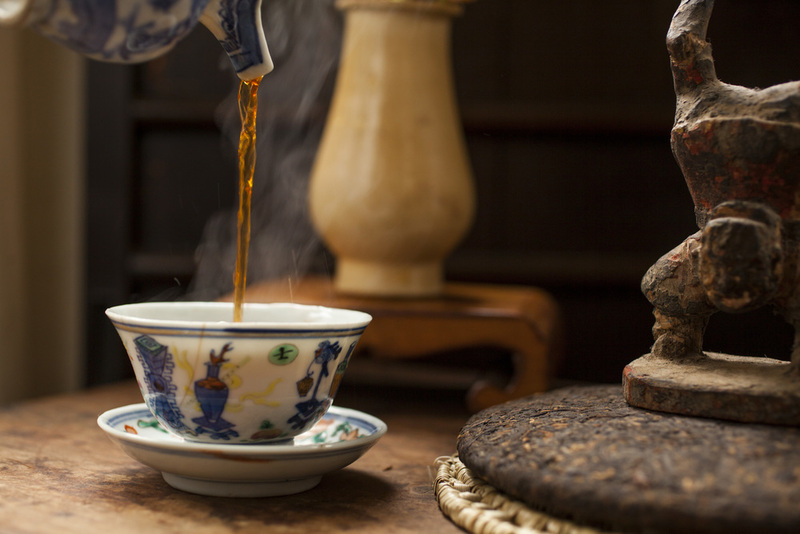 In describing the adoption of antiques into tea practice I would have to say that the sensitivity that tea awakens is an individual gives them the awareness of the embodied history of any given artifact. Tea opens the eye and the story is known. Certainly, beauty is key to the enjoyment of any given item, beauty is in the eye of the tea-holder (ouch! sorry, couldn't resist that), they say, and usually finding it visually attractive is the first key. But, boy have I seen some ugly-to-me tea ware! Please understand this is not ugly as opposed to beautiful, its just that I know I'd never even consider adopting it because I find it so unappealing. Why we are attracted to what we are, we know not. If you visit us at the teahouse, or browse our website, you will be confronted by large amounts of old things adorning our displays. For the purpose of the website it seemed like the best way to honor these pristine teas was to create an alter for each one framed out of pieces from our personal collection. It's about 98% old stuff and, in essence, represents the endeavors of those who have come before us, conveying the way of tea in the now, and leaving treasures behind to ensure that the lineage of integrity in tea stays available. The wisdom of well-made products can be felt in them, but doesn't necessarily always lend itself to quick, high out-put convenience. All of these things are here to be enjoyed, old or new, and maybe just tuning into what you really need in your life will lead you to your tea bowl. Try not to let me or anybody else influence you in this.